①WiFi Range Extender (Repeater)- Extend WiFi coverage of an existing wireless network. ②Wireless Router- Create an instant private wireless N network and enable multiple devices to share it. ☛Provides a WAN and a LAN. ☛Wireless N speed, data rate high of 300 Mbps. ☛Support WiFi protection Settings (WPS) function. ☛Support WEP, WPA/ WPA 2,WPA-PSK/ WPA2-PSK encryption. ☛Working with any standard wireless router, external antennas for faster and more reliable Wi-Fi. ☛Strong wifi signal covers your bedroom, floors, restroom, garage, basement and garden.You will love it!!! ⑤Enter the WiFi password of your wireless router ;. If you still have questions about installing,please feel free to contact us.We will reply within 24 hours. 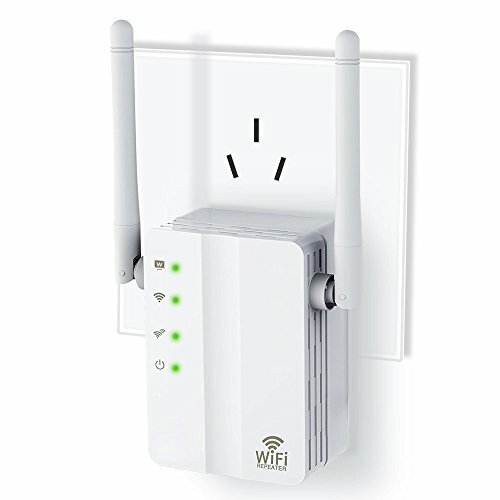 ✔Boost WiFi Coverage:The mini WiFi repeater with 360 degree wifi signal covering can extend your existing Wi-Fi coverage to long distance and create a stronger signal in hard-to-reach areas. Allows more users to share one account to access Internet at will.Small size with better performance and wider coverage. ✔3 in 1 function :Router Mode, Repeater Mode, AP Mode.Compatible with any wireless network, router and Wi-Fi enabled devices including Smartphone, iPhone, iPad, Tablet, Laptop, Desktop, Smart TV, etc. ✔Easy Installation:Convenient for the wall-plug design.Wall plug design making it easy to install and move. WPS button supports "One-Press" connection and encryption.Easily expand wireless coverage,accessible from any device, including iOS and Android mobile platforms. ✔High performance :Dual high-gain 5dBi external antennas enhance wireless signals for stable data transmission .Reliable wireless network speed up to 300Mbps covering your bedroom, floors, restroom, garage, basement and garden,smooth for HD video or 3D video streaming and online gaming. The hole nearby can help to dissipate the heat when working. ✔ Two Fast Ethernet port: This router connect to Internet by WAN port, and then other terminal devices can connect to this router by wireless connection or connect to this router's LAN port by wired.